Accurate thickness monitoring or controlling for SEM coatings is important for reproducible and optimum coatings. Estimates using a white tile with a drop of oil or using instrument settings will not accurately achieve reproducible results. A much better method is to use a high resolution thickness monitor or controller to measure coating the coating thickness directly in the chamber,during deposition, with a sensor. The affordable Cressington MTM systems offer an unique thickness resolution of 0.1nm for carbon (density 2g/cm3). The Cressingtom MTM-10 thickness monitor system can be installed in any of the 108 series sputter or carbon coaters. The Cressington MTM-20 thickness controller with programmable termination function is fully compatible with the Cressington 108auto and Cressington 108auto/SE sputter coaters. Both are supplied with a full installation kit including crystal holder, CS 108 vacuum feedthrough, oscillator box and cables. The Cressington MTM-10 thickness monitor accurately measures the coating thickness in the Cressington sputter coaters and/or carbon coaters with an exceptionally high thickness resolution; 0.1nm for carbon (2g/cm3). Reproducible coating thickness, independent of coating parameters such as gas pressure, distance and current are easily achievable. Optimum coating thickness can be quickly determined and readily reproduced. With the tooling (correction) factor adjustments can be made to show the actual coating thickness on the display of the MTM-10. 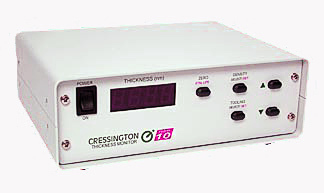 The Cressington MTM-10 thickness monitor has a memory for 4 coating materials and 4 tooling factors. Supplied as a complete kit to install in the 108 series sputter coaters and or 108 series carbon coaters. 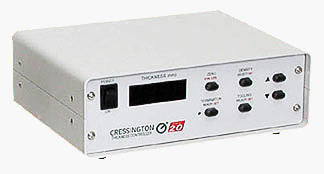 The Cressington MTM-20 thicknes controller has the same high specifications as the MTM-10 and additionally it includes a termination function for the Cressington 108auto and 108auto/SE sputter coaters. Once the programmable thickness has been reached, the power supply to the sputter head is switched off. 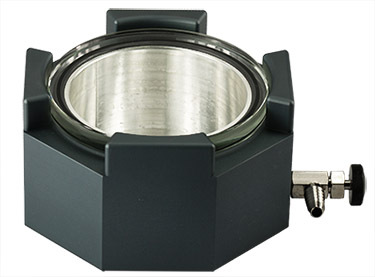 This function is ideal for series of reproducible coatings. The MTM-20 termination function can fully be incorporated into the automatic coating cycle, which allows the operator to attend to other tasks during the coating cycle.